1. The author is responsible for the accuracy of quotations and submits an only original article which not has been published in any other journals. 2. It would be better if the author of the submitted article is one without any co-authors. In the case of co-authors, SHV Editor and Editor Board accepted only no more than one co-author of the submitted article. 3. Authors must disclose any substantive conflict of interest that might be construed to influence the results of their research. All sources of support for the author/research should be disclosed in the submitted manuscript. 4. The author and co-author fill the Authorship Statement for indication of the contribution in the preparing of the article. The Authorship Statement you can load at the bottom of this page. 5. The author(s) indicates the type of the article (overview or original scientific and methodological article) by the separate line above the title of the article. 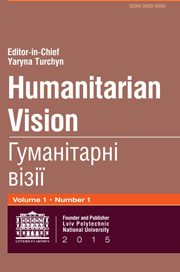 Requirements to the submitted articles for the scientific journal «Humanitarian Vision». 1. Information about the author (authors): first name, patronymic name, surname, scientific degree, position and place of work, contact phone, e-mail, address. - the conclusion is drawn from the research and prospects of further investigation in the respective direction. -the high quality of English translations of all articles is a mandatory requirement. 4. Technical format of the article: all margins have to be 20 mm; 14-point Times New Roman, 1,5 line spacing; 10mm indent. What concerns symbols, the text has to contain only these characters for quotation marks and dash respectively: «», «–». There should not be odd spacing, particularly before or inside square brackets or parentheses. To avoid this, the feature Show formatting marks should be used. Hyphens are not allowed. 6. The article has to be submitted in the original language (Ukrainian, English, or Polish) electronically as a MS Word for Windows file on a CD or via e-mail. 7. All the articles submitted to the Editor Board are peer-reviewed and are subjected to double-blind reviewing by two anonymous Ukrainian or foreign specialists. 8. Responsibility for the content, accuracy of facts, quotes, figures, and names is born by the authors of the text. The following works are admitted: articles intended to cover issues in the fields of Political and Philosophical Sciences, reviews of new books, textbooks, and tutorials. Submitted materials have to be topical, stylistically and grammatically edited, and use modern scientific terminology. Editorial office reserves the right to minor editing, shortening, and literary correction of articles (preserving main conclusions and the style of the author). The Editorial Board may not share the world outlook of some authors. If an article does not meet the requirements, the editorial office reserves the right to deny publication of the materials.